GERRY ANDERSON MOONBASE ALPHA FANS have the chance to make a realistic diorama with the MPC 1:48 scale Nuclear Waste Disposal Area 2 kit. The Nuclear Waste Disposal Area 2 will go nicely with the existing 1:48 Eagle Transporter kit from MPC (below). Many of the kit’s runners are identical, especially for the cones and lamp posts which have duplicate parts. There are ten astronaut figures in all, four seated and six standing. The standing figures have separate arms, which can be swapped around to create different poses. Those for the seated figures are fixed. Each figure has a separately moulded back-pack. There are bases for the supplied cones and eight lighting units, the latter in two sets of four. These are mostly pre-cut, though the lamp post supports need their edges trimmed at the mating surfaces, and holes drilled for the wiring. Two lighting packs are supplied, and these run from two AA batteries that power four three-LED assemblies, one assembly of three for each lamp post. MPC assumes you know how to add suitable material to simulate lunar dust for a realistic, blended surface. You can pick and choose which components you want to use, which will depend primarily on how big you want your base to be. If you want to include an Eagle, the base would have to be reasonably large, probably up to 1000 x 600 mm (39 x 26 in). But if display space does not allow this, you can use just some of the parts on a smaller base, as depicted here. There is a pleasing extra in the box, a 1:24 scale Moon buggy and crew, which could be the start of more accessories to this larger size. The 1:24 scale parts are moulded in yellow, rather than the slightly milky translucent white of the main components. Two upper body parts for the buggy are supplied, because it was thought there could be a slight moulding fault with the top (part 2) on the main runner, which showed up as sink marks. But this does not appear in the majority of the kits, so you may well have two useable upper body parts for the Moon buggy. Interestingly, the kit uses more-or-less redundant vacuum-forming technology for various parts. 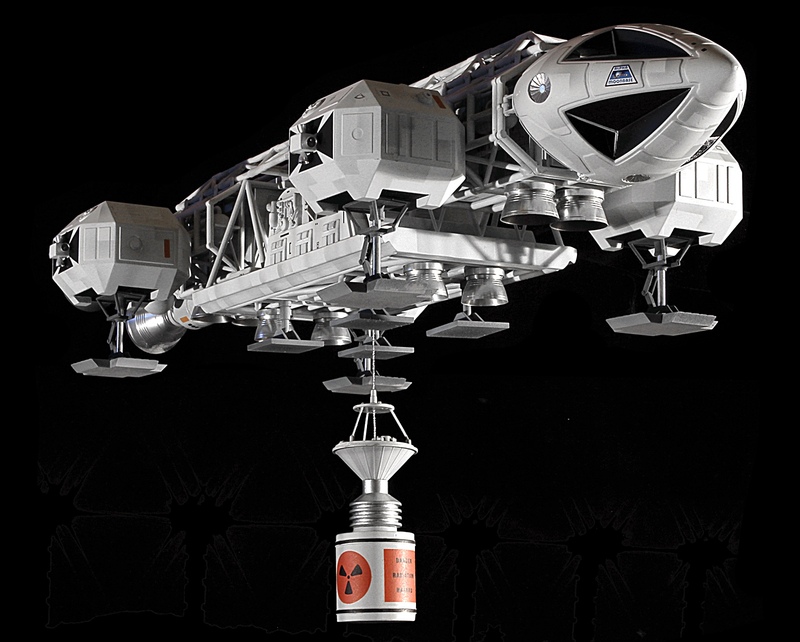 The use of vac-form for diorama bases is not new to MPC, also being used in the Space 1999 Alpha Moonbase. Vac-form has also been seen in other MPC models, such as the Desert Chase from Raiders of the Lost Ark and several Star Wars diorama kits. The box top (header pic) shows plenty of detail, though the top-left image shows more cones and lamp posts than are supplied. You do not get the canisters in the pit either, this set-up being scratch-built for photographic purposes. The lower picture is more representative of what is in the box. The box (above, below) is a mine of visual information. This side of the box (below) gives painting and decal placement for the Moon buggies. Details for the cones (below) are shown on the opposite side. Box ends (below) have paint details for the lamp posts. Layout of the white and clear parts (below). One of the lighting units has been unpacked. The yellow runner (below) for the 1:24 scale Moon buggy. Note an additional upper body is supplied, in case the one on the main runner suffers from sink marks, though most are problem-free. I made a change to the 1:24 scale helmet visors (below). Rather than painting them with the recommended amber (it looked wrong) I painted them black, with a yellow tint on top. The completed Moon buggies (above, below) are shown here in the two versions. The comprehensive decal sheet duplicates almost all the markings, though some of the 1:48 ones are very tiny! Half of the kit was used for this diorama (pix below), so there's just one cone, three walking figures, and a buggy. I used ceiling plaster for the lunar surface, indenting various boot prints and wheel-tracks into the soft material. I then sprayed it with a fine mist of water to set the plaster. When it had hardened, I placed the figures in position. Click here for more Space 1999 stuff at SMN. Thanks to Round 2/MPC for the review kit. SMN note: The choice of orange for the helmet visors is an odd one. Maybe it’s the MPC version of the reflective gold finish, used for the Apollo missions of half a century ago.